Step 2: Measure out the fabric and mark where you want to cut. Since I like a snug fit on the pillow inserts, I like to cut the fabric "0.5" less than the overall size. For example, the pillow size was 22" x 22" so I cut the fabric in squares of 21.5" x 21.5". Step 3: Next cut the fabric. I prefer to do it with a blade and straight edge since I'm not the best at cutting straight with scissors. Here are the two squares after they are cut. Step 3: Face the printed sides of the fabric together and have the non-printed sides facing the outsides (I have peeled back some of the fabric in the photo above to show you what I mean). Step 4: Pin the pieces of fabric together using straight pins. Step 5: Now it's time for the zipper part. The zipper I like to use is the Coats and Clarks all purpose zippers, which I purchase from Hobby Lobby or Jo-Ann Fabric. I like to buy the zipper larger than the size of the pillow, so in this case I was sewing a 22" pillow cover so I used a 24" zipper. 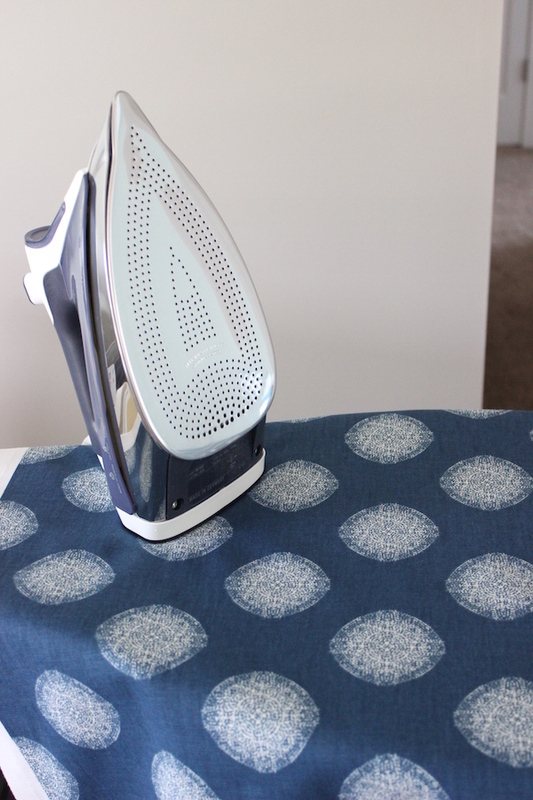 Often times I just use the natural color ones, but since they had a blue one that was similar to the blue in the fabric I chose to use this. Step 6: Unzip the zipper all of the way and flip it over (so that the zipper head is faced down) and have the right side of the zipper lined up with the bottom piece of fabric. Have the zipper extended an inch past the end of the fabric so that it's out of the way when it comes time to sewing. Step 7: Secure the zipper into place using straight pins. Step 8: Now it's time to start sewing. 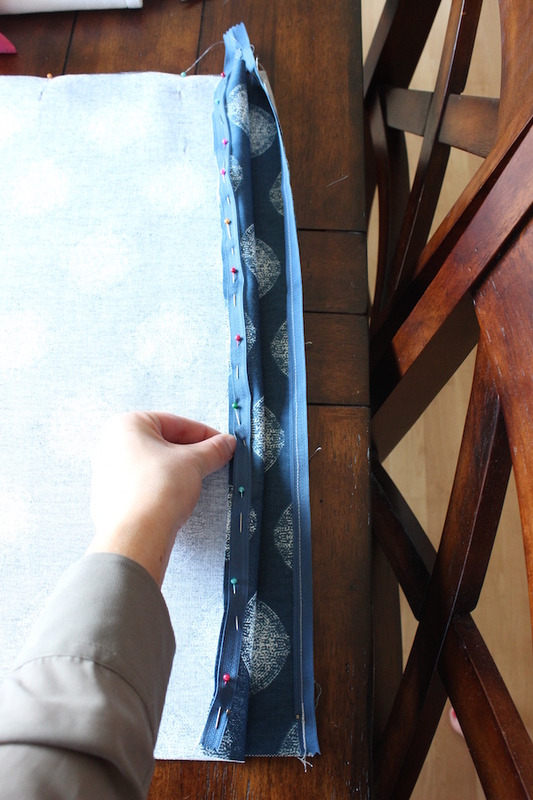 I'm still new at sewing so I like to take the extension table off so that I can have more control with feeding the fabric. I also like to put a piece of painters tape on the needle plate to serve as guidance when sewing a straight line. You want to sew as close to the teeth of the zipper, so in order to do so I put the left foot of the presser foot on the teeth of the zipper. Also make sure to do several back stitches at the beginning and end of the zipper to make sure that the stitch doesn't come undone. Here is the one side of the zipper now stitched on. Excuse the not so straight stitch - I'm still learning! Step 9: In my opinion this step is the most tricky and most important step in the process. In order for the zipper to work properly and close, the zipper teeth have to be aligned straight . To make sure they are aligned, sandwich the zipper and pieces of fabric together (placing them on top of one another) and then peel back the top piece of fabric and zipper in small sections and using straight pins, pin the zipper to the top piece of fabric. Here is what it looks like after the zipper is all pinned on. This used to take me multiple tries to pin it on correctly, so if you find yourself in the same position you're not alone, it can be quite frustrating at times! Step 10: Sew on the left side of the zipper exactly like you did in step 8. After it's sewn on, I'm happy to tell you that the hard part is over and it's an easy downhill ride from here! Step 11: Sew the remaining 3 sides. I have found that it works best to start on the side that is parallel with the zipper and then do the other two sides next. Also, I like to close the zipper half way when doing this step so that it helps with keeping the fabric aligned and that way you know that the zipper will actually close once the sides are completed. Step 12. Cut the the zipper tail off using scissors. Step 13. If you have ever looked a pillow cover, you will see that the zipper never extends the whole width of the bottom of the pillow. Instead, at both ends there is fabric next to it that acts as a stopper for the zipper. 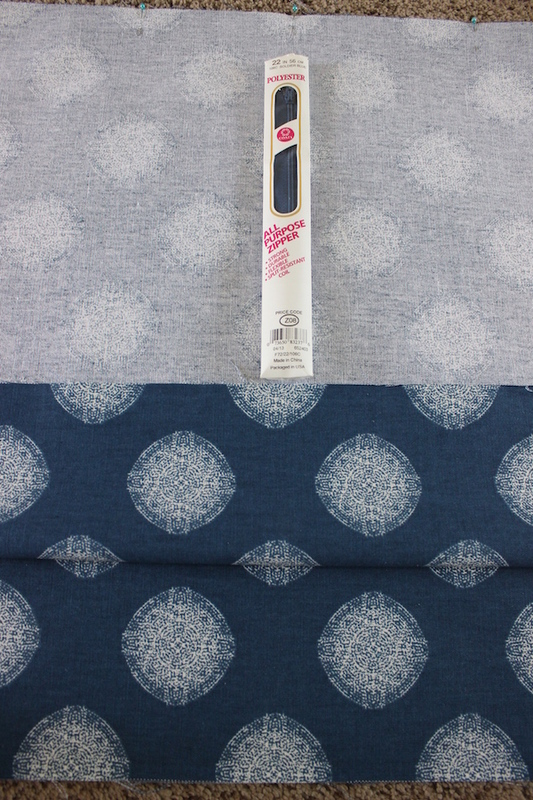 To create the stopper, measure 2" -3" in from both sides and make a mark on the fabric in front of the zipper. In this case I did 3". Step 14: Starting from the end, sew a straight stitch to that line that you marked in step 13. You want to sew as close as you can to the teeth of the zipper, so put part of the presser foot on the zipper when sewing to ensure a close stitch. Step 15: After that, turn the pillow cover inside out and you now have a pillow cover!! 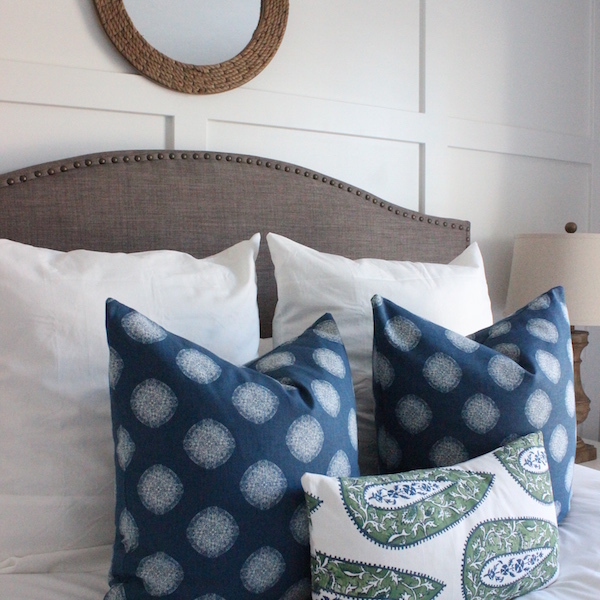 The inserts that I used for these pillows are from Crate & Barrel and are down alternative, but you can find inserts at a lot of different stores. So what do you think, easy enough to try? Just like anything else, it takes a couple of practice times to get in the hang of it but once you have done it a couple of times I promise you will want to keep making them! Disclosure: some affiliate links used. 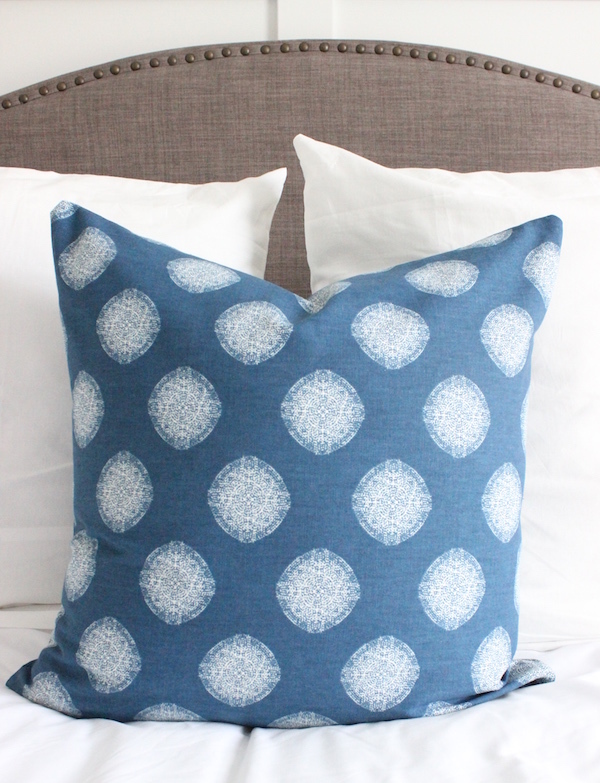 I'm ready to take the plunge and start making my very own throw pillows especially with the help of your tutorial do you have any recommendations for a sewing machine. Especially for this beginner.